The Cricket Committee of Dhaka Metropolis (CCDM) in its technical committee meeting held on 06 April 2019, has upheld the decision of the match referee to award full (02) points to Mohammedan Sporting Club Limited from their Walton Dhaka Premier Division Cricket League 2018-19 match against Brothers Union held at the BKSP Ground 4 on 02 April 2019. 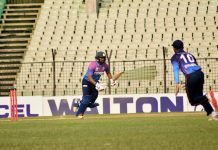 The decision to award the match was taken in light of Brothers Union’s refusal to play after resumption following a rain interruption as per clause 16.2.1.2 of the Match Playing Condition of Dhaka Premier Division Cricket League 2018-19. An official reprimand has also been issued against Brothers Union as per the provisions in the Match Playing Condition.